I realised that there is so much I can write about KL and Bali, that it may not ever happen … So, I have decided to put the summary version down. Then at least I can write down the detail if I have the time. You see, the detail is contained in a little pocket book that I carry around with me whilst on holiday. I write down everything. Because I learned very quickly that you only notice differences in culture etc once, thereafter you quickly become used to something which a few hours ago was an onslought on the senses. Central Market – we had the loveliest food here. It’s not a true ‘authentic’ market, because it is aimed at foreigners. So I guess you could say it is the toned-down Malaysian experience! 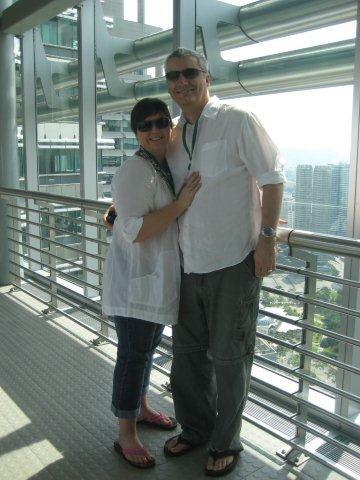 The magnificent Petronas Towers are quite something. Built as the headquarters for the National Oil Company, they truly dominate the skyline. They liked my instructions on how to remember my name as ‘diesel’ with an ‘L’! Cost to go up the Towers: RM40 (£8.20). The trip was very well organised﻿, not at all crowded (only 120 tickets per session are sold), very informative and the views were spectacular. The Skybridge viewing deck is on the 41st floor, and recently they opened to the public a further viewing desk on the 86th floor. 12,000 people work in the two towers. The grounds include a park and a mosque. And the building is clad in stainless steel, so it sparkles in the sunlight, and is lit up at night. On the ground floor, there is an exclusive shopping centre (which we didn’t go to). 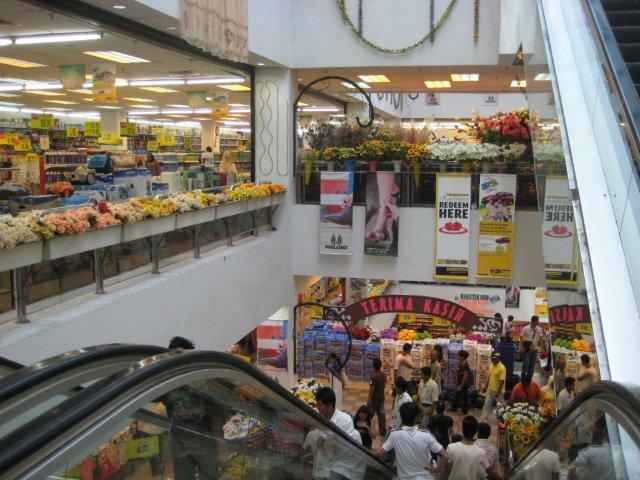 Shopping certainly is one of the biggest tourist attrations in KL. There is shopping centre after shopping centre. Many of them specialise in branded goods, unbranded goods or electronics etc. But I think you can find anything you heart desires here. In contrast to﻿ the high rise building and modern architecture, the old part of the city with it’s colonial memories, have been preserved. However, in the modern sections of the city, the history is all but been stripped from sight, leaving a fairly soulless, concrete jungle. However, in spite of this, the city is busy, vibrant, and colourful. Most public toilets are revolting. The ones at the National Museum were awful. It stank terribly (use your imagination), smelling more like the gents than the ladies! You even have to pay to go in, but I don’t think that that money is used to fund the maintenance and cleaning. Generally there is no toilet paper, just a hose. Some places you’re lucky enough to find western toilets, but mostly they are asian toilets only. At one place (that only had 3 cubicles), I had to walk out of the 1st two cubicles as they were so gross. As I turned to enter the third one, I was faced with a Chinese lady squatting on the toilet seat with the door open! No wonder they pee on the seats. 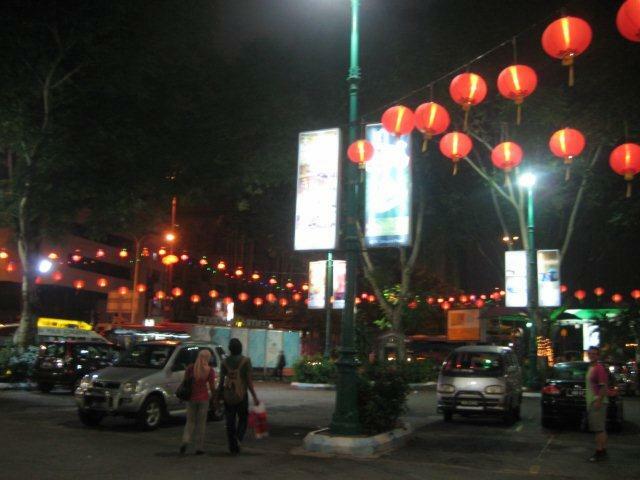 I just loved the chinese lanterns up at night. Made the whole city seem colourful. 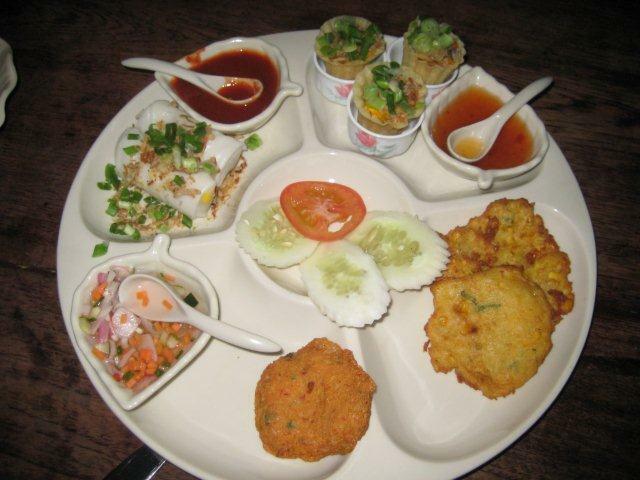 These nibbles were so tasty – especially the corn fritters. They were my favourite. Don’t think that KL airport is also a shopping mecca, as certainly isn’t. The choice is actually very poor – most shops sell chocolates! Food is cheaper than drinks! At the airport, an asian breakfast cost RM10 (£2.05), light western breakfasts were RM6.30 (£1.30), but a coffee was RM10.90 (£2.25)!! The one thing that is very cheap though, is electronics. We were really tempted to buy an iPad, but we were dithering so much, we missed our window of opportunity, and then it was too late. In hindsight it was perhaps a good thing as the iPad 2 has just been released and we have ordered one of those.